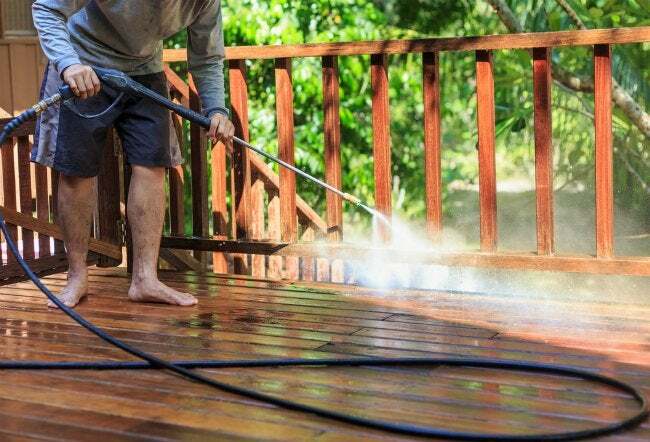 Bob Vila Radio: Does Pressure Washing Ruin Your Landscape? Though it's a useful and versatile tool, the pressure washer do more harm than good if you don't take the proper steps to protect your plantings. Want to remove years of dirt and grime from the exterior of your home? A power washer might be the right tool for the job. However, it can be bad news for your landscaping. Proceed with caution. If you’re going to use bleach as part of the cleaning solution, opt for oxygen bleach over chlorine bleach. The former goes easier on foliage. Move as many potted plants as possible out of the immediate area. The plants you can’t move should be hosed down thoroughly with clear water before you start. That’ll naturally dilute any overspray that happens to land on the plants. Another alternative is to cover your plants with plastic. But it’s important not to cover all the plants at once, especially if you have a large home and it’s a warm day. Prolonged periods shrouded in plastic can smother even the hardiest species. Covering plants becomes essential if you have natural wood siding and plan to use a sealant after power washing. That’s because most sealants can’t be washed off and are lethal to flora.